"I'd sit and drink wine all day, but then I'd miss seeing you fail everyday." Dionysus, the Greek God of grapes, wine, and winemaking. DJ grew up in NYC, being used to the funky smells and the ragged-acting. At age 5, DJ was attacked by a wretched monster, shaped oddly. It left a long, permanent scratch on her back. Her mother made up a lie, saying that she hallucinated it. Speaking of Elizabeth, DJ despised her mother. She was a drug-attack, an alcoholic psychopath. Her mother would enter the house with a cigarette in one hand, and a bottle of Heineken in the other. DJ's mom would only feed her when DJ begged. Elizabeth would ignore the simplest requests of small, lost DJ. At age 14, her mother had a drug overdose, and went into Cardiac Arrest. When out of the hospital, Elizabeth revealed to DJ that she is a demigod. DJ tried out her powers, growing a well-made garden in the backyard filled with grapes. Elizabeth used this as a chance to make money. DJ's mother started making wine from the grapes and selling it. With the money, DJ's mom bought drugs. Half of it she used, the other half, sold. DJ got fed up with this. A year later, her mother started to go even more crazy. Her new boyfriend, Morysee, was a drugee, too. They were both doing drugs when DJ found a loaded gun. She crept into the room to see Morysee standing over Elizabeth with a knife. Blood covered both of them. No tears ran from DJ's eyes. Instead, was a grin. She dropped the gun, and laughed as she walked out of the room, the house, and into her friend, Melina's, house. Telling the story of her life, Melina told her about a camp of demigods she heard of. DJ got directions and caught a bus to where the camp was. The whole time, grinning. Her dreadful mother was dead. Finally. DJ is super petite, a trait she got from her mother. Her exact height is 5"1, the size of a 6th grader. Her figure is like a wall, no curves at all. Like her height, DJ's weight is also very small. She is only 90 lbs. DJ is both skinny and short, which she loves. Sticking with her petiteness, DJ is also very pale. She blends in with a cream-colored surrounding perfectly. On her back is the scar from the attack. DJ has a heart-shaped face, which has splotches of freckles here and there. Surrounding her delicate face is her hair. Layers and layers of messily-styled black hair flows down around 5 inches past her shoulders. DJ's black bangs messily border her heart-like face. Some strands cover her eyes, long enough to reach the tip of her nose. Now, her nose is very cute! It also is pierced with a silver nose stud. Like her nose, her ears are also pierced. DJ usually wears black zipper earrings, or zebra-striped studs. As far as her eyes go; They. Are. Amazing. DJ has bright, green-blue eyes that at times look like purple surrounds her pupil. As a normal teen would, DJ likes a ton of eyeliner bordering her eyes. No mascara, though. DJ has naturally long eyelashes, curving upwards. Around her left eyebrow is a small freckle. It has been there since birth, and DJ calls it her birthmark. To finish of her appearance, here are things about what DJ wears. She almost always wears 13 macrame bracelets of random colors around her right wrist. DJ usually wears classic skinny-jeans, converse, skin-tight Graphic-Tee, etc. Sometimes, she feels a little awkward, and wears Victorian-styled corsets or a fluffy tutu. In DJ's words; "When I feel down, I dress like I would in my dreams; a gothic princess." DJ, like her father, is full of herself. Not the kind that walked around flaunting their money or their looks. She is the kind that if not feeling that your worthy, will ignore you. DJ never has the time of day to memorize names, another trait from her father. The teen is full of a sarcasm humor and a satire personality. Yes, DJ does drink wine. It doesn't affect her like it would to someone else. 8 servings of wine is like 1 for DJ. She can sometimes be seen holding a glass of wine, or a bottle itself. DJ usually gets tipsy at around 12 servings, and officially drunk at about 20. Though she is not the healthiest, the wine does not affect her health. Sometimes, DJ actually uses it as a boost for battling, as the homemade wine DJ makes is like a homemade potion: Giving her energy. She is very irresponsible. DJ is mature, but can seem like a 3-year-old at points. Her jokes can be childish sometimes, but tries to keep them likable. DJ is also very well-built, personality wise. She is strong, and doesn't take crap from anybody. Living with her crazy mother straightened DJ out. No, she's not afraid of anything. Anything except that creature that attacked her. Other then that, DJ likes to be in charge. Of course, she'd like to escape camp and run away to a paradise, but stays for protection. The monster -unknown- that attacked her. If ever brought up, she might get teary. If ever seen, she'll take revenge like there's no tomorrow. DJ has the ability to control the growth of all grapes and berries, and grape vines. She also has the ability to control their movement. DJ is also an abnormally-expert wine maker, and doesn't get drunk as easily. Her skills at fighting are average. DJ loves making wine, and she usually sells it at the camp. She is also great at playing the flute and the drums. DJ is super flexible, and great at gymnastics. A 3"5 long, celestial bronze sword with a curved base, easy to hold. She named it Ginger, the base being a ginger-color. DJ's shield is an iron shield, circular, heavy, and always useful. DJ owns a white horse, unknown breed, named Dazzle. DJ is, as usual, ADHD and Dyslexic. As for being Dyslexic, her grades are usually B's and C's. "Don't give up, no. Not until the story ends." Tyche, the Goddess of good fortune. Phoenix was born in Tokyo, Japan. A city girl. At a young age of 3, her and her father moved to Las Vegas for her dad's job. There, Phoenix learned proper English, and sounded American. Her father, Dan Lee, became wealthier and wealthier. At only age 5, Phoenix got a cellphone. Dan spoiled Phoenix. After five years of living by the Strip (main Las Vegas area), Dan found a demigod named Celeste Taylor. Being a daughter of Aphrodite, her beauty attracted Dan. To her likings, Dan was filthy rich. She was amused by this, and they quickly got engaged. Only being 10, Phoenix was sure that Celeste was not normal. Fake. Dan told Phoenix about Celeste's powers, and her owns. Phoenix thought that was 'cool'. The tween never really talked to Celeste, so on the wedding, she decided to say her powers. That's when Phoenix overheard Celeste gloating to her friends about how she was using Dan. Phoenix ran to tell her dad, but he didn't believe her. Phoenix begged and begged. Dan, being fed up, told her she was jealous and needed to leave him alone. She then tried out her powers, making Celeste filled with bad fortune, and the ran away home. Phoenix trashed Celeste's stuff (she had moved in with the two). During her rage, she found Koolaid-red hair dye. Being P.O. 'd, she decided it was a good idea to dye her hair. So, Phoenix dyed her hair Koolaid-red, then found scissors, and chopped up her hair. Didn't look to bad. She then began down the Strip, where she met Alex, a satyr rescuing two other demigods from the Lotus Casino. He led the three to CHB. Sadly, the two were children of Poseidon and died along the way of an attack. To this day, Phoenix has not heard from either Celeste or her father. Phoenix is regular height, 5"5, and is about 90 lbs. Her flat, paper-thin body is one of many traits you'd know her by. Phoenix is rather tan. Her tan skin gives you a reminder of summer and heat; heat being fire; fire making a Phoenix. She has a very smooth skin, smooth as a baby's bottom. Of course, Phoenix is Asian. Her eyes are a dark brown color, looking a little red. Not possessed red, but a shade of it mixed with dark brown. They are big eyes, not huge ones, though. They are stretched (or whatever you call the eyes that Asians have xD), and she usually borders them with a black eyeliner. Phoenix has jet-black hair, but you'd never notice. She died her hair Koolaid-red and chopped it up. Think Hayley Williams' hair ( this hair). She usually wears it down, letting it blow in windy situation. Phoenix has a birthmark on her shin, shaped like a bird's foot (sort of). She usually wears a tee-shirt and jeans, or a skirt and leggings. Depends on her mood. Phoenix usually wears hoop-earrings, her favorite type of earrings. Phoenix has a sweet heart. She's caring and lovable. Her heart is always in action. Basically, Phoenix is a warm and loving, caring and friendly girl. Yes, Phoenix is smart. But she's also careful. Her conscience is always in play. But, if you see her history, Phoenix can also be a rebel. She's sensitive, so you get her mad, she'll do something crazy. Yes, she always relies on her conscience. Sometimes, her conscience just disappears, and Phoenix relies on... nothing. Well, technically, her conscience /is/ there, but only the bad side. This could really hurt her. Phoenix is wise. Yes, she's Dyslexic and ADHD, but you wouldn't be able to tell first look. She's smart and intelligent, a nice role model for y,ounger kids. Never has Phoenix flaunted her money (took around 3,000 dollars when she left...), never brags or gloats. She's a good sport. Phoenix does get competitive, thought, and will try her best to win at everything and anything. If she looses, she's still nice about it. Same for when she wins. Her fatal flaw is that Phoenix always wants to know about what happened to her father. She's too scared to contact him, and sometimes waits hours for a call from him. Phoenix can grant anyone or anything a bad fortune. Her powers aren't fully in yet, so she cannot grant good fortunes yet. And, her fortunes can not be controlled yet. Meaning, if she grants someone bad fortune, she cannot control what bad thing will happen. Her fighting skills are average, and she's mastered archery. Phoenix is amazing at horseback riding. She also can make Sushi amazingly (her father taut her) and is a black belt in Kung-Fu. Phoenix loves to dance, but is shy about it. Other talents of hers are futball, flag football, and swimming. Phoenix has two 2"3 long, lead daggers with leather bases. She also has a wooden bow encrusted with glass designs, and 100 glass arrows (she makes them, but only carries around 100 at a time). Phoenix never uses her shield, but she does own an iron shield. Phoenix is, of course, ADHD and Dyslexic, but is a straight A student. "Keep talking, I don't care." Ethan was born and raised in Orlando, Florida. His mother, Theresa, was filthy rich. She spoiled him, spoiled him crazily. Terry was actually a decent mom, though. She cared for Ethan, always there for him, and loved him deeply. When only 6, Terry told Ethan that his father didn't leave them, he died. This made Ethan very sad. When he turned 9, his mother got Ethan his first cell phone. Eventually, Terry got over-protective of him and put a tracking device in the phone. One day, Ethan got attacked by a monster of some sort. His mother would now never leave his side. When Ethan was 11, his mother started dating a man named Joe Myers. He was a sick man, and had just came from jail. Joe abused Terry. Ethan got so mad one day, and tried to punch Joe. When he punched him, a stream of water shot Joe's eye, and he was now blind in one eye. Ethan, confused, asked his mother what happened. She explained everything to him. Two months later, another monster attacked. 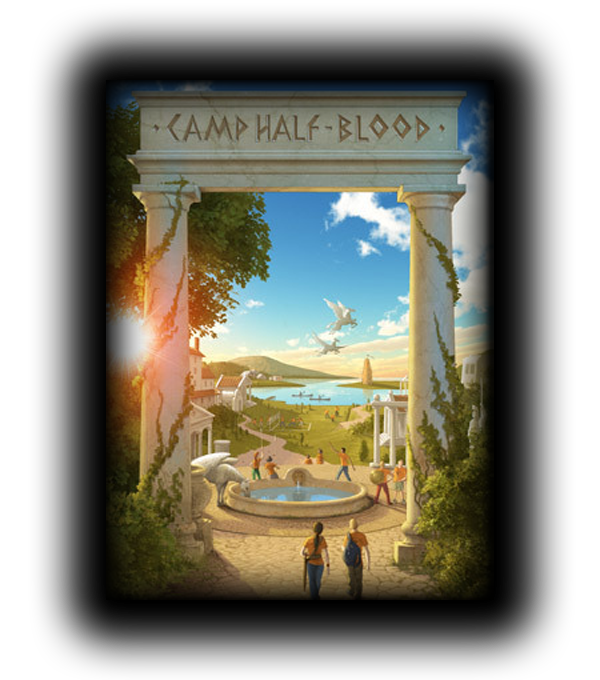 Terry sent Ethan to Camp Half-Blood, and left Joe. Like Percy's mom, she was using Joe for safety. Ethan is tall, being 5"11. He's also 130 lbs, a little on the light side. He's muscular, but not a body builder. Ethan has an 8-pack, which he loves to show. He either is shirtless, wears a skin-tight Under-Armour shirt, or just a regular tee. Being a son of Poseidon, Ethan has deep, crystal blue eyes that sparkle in water. They pop out less on his tan skin, and sometimes look brown. Ethan is African-American, but he's light skinned. He has a strong jaw, but ladies love it. Ethan usually shaves his head bald with a slight mohawk. People call them frowhawks. His fuzzy hair is a dark brown, a chocolate color. Ethan, very in love with his slight bit of hair, likes keeping a come with him. Yes, Ethan is growing a mustache and beard, but he usually shaves. The teen is a rebel, so a rebel needs a rebel look, right? Ethan has his left ear pierced and always wears a silver stud in it. Also, on his right arm, are a collection of tattoos. There are 10 skulls, a dragon, some fire, and a guitar. Yes, he's underaged. But, who cares? He also usually wears jeans and converse. Ethan is very outgoing. He's tough and rebellious. Ethan stands up for what he believes in. He is very street-smart, and knows the gossip well. Mostly, because Ethan likes to be in the gossip. He's very tough, but not a bully. Yes, he's strong, but was raised right. Ethan won't throw a punch unless he has to. He can make bad decisions some times. I.e., punching a kid or making fun of them. In the end, Ethan will probably apologize. Ethan is a flirt. He loves flirting with girls. Once he finds his match, he'll take good care of her. But first, they might fight and all because Ethan thinks he's all that. Sometimes, the teen will even cat-call, or do challenges to see how many girls he can get numbers from. This gets him in trouble allot, same with him being a rebel. His soft spot is swimming and water. Ethan devotes his time to water, water-creatures, and of course, horses. Ethan is super afraid of meeting his dad. More anxious than afraid. Some days he'll do anything and everything to meet Poseidon. Others, he dares to talk about him. Ethan can manipulate water very easily, and can speak to horses and Pegasi. Ethan is also very advanced in fighting. Ethan loves to swim, ride horses, fence, play football, and meeting girls. Ethan also sings and plays guitar. Ethan owns a 4" long, celestial bronze sword named Atlantic, and an iron shield. He has a black Pegasus named Queen. ADHD and Dyslexic, of course. Physical appearance: McKay is average, maybe a tad below, average height for her age, around 5"6. She is rather skinny, too, being around 100 lbs. Yes, McKay has an hour-glass figure, which she usually flaunts in too-tight skinny-jeans and Graphic-Tees that stop short enough to show her cute, outie-bellybutton. McKay has thick, thick, auburn layers of hair. Being unpleased with her hair color, McKay died her hair platinum blonde that border her heart-shaped face. The thick, yet straight, layers of hair are neatly styled and go down to McKay's shoulders. Her skin color works well with her hair, being it's very creamy-pale colored. McKay has dazzling, aqua-colored eyes that are surrounded by one-inch eyelashes. This girl doesn't leave her BUNK without applying makeup. She even has a makeup table next to her bunk! Personality: McKay is all about appearance. She's no daughter of Aphrodite, but it's hard to tell. At first look, you think, "'Mean Girls' have come alive!" But once you get to know her, McKay is really nice. She's friendly and caring, always thinking about others. Being a daughter of Erato, she is very flirtatious. McKay is a huge flirt towards guys: single or not. She likes hitting on guys, which sometimes makes her forget about other important things. Her major flaw is that she hits on guys way too often. McKay isn't the smartest, so she often asks for helps. Yes, she flunks. Allot. It gets her in trouble with her dad allot, which is not a good idea. McKay is rich, obviously. She always relies on money. Sometimes, it seems like she's a shopaholic. McKay only power-shops when she's depressed. Well, at least she's filled with friends! Pets: McKay has a Shagya, a type of horse (see here). Her name is Winter, and she is all white. Her eyes are brown and large, and she has tons of beautiful hair! Weapons: McKay does have lots of down falls, McKay makes up with her excellent fighting skills and reflexes. They are so good, one her ex-boyfriends (son of Hephaestus) made her a celestial-bronze sword with a leather base. It stretches out four ft, and is named Princess. Don't look at McKay, her ex carved it into the sword, filled it with glass, and named it that because at the time, McKay was his princess. Talents: For her demigod talents, McKay can say poems that will manipulate love. Like, if she says a love poem about two people falling in love, they would. McKay can also make someone fall in love with someone/something else by reciting poems about their love, and McKay likes making guys fall in love with her. Once done, McKay cannot reverse this, only weaken the love herself. For non-demigod talents, McKay is skilled in horseback riding, gymnastics, cheerleading, shopping, getting guys, and, of course, putting on makeup! Other: McKay is ADHD and Dyslexic. Her father is very rich, and willing lets McKay have some of his money whenever. He usually mails it to her. xD Ahaha, you make me laugh, Moo.